If you've ever wondered how addictive cigarettes are, look no further than this turtle. 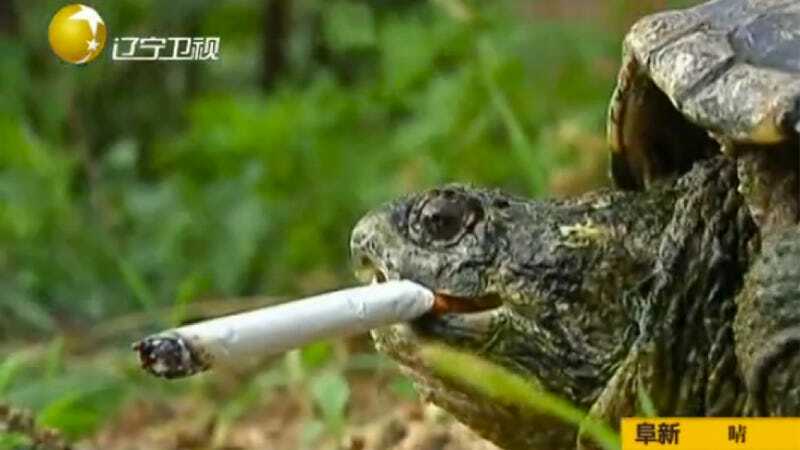 Various Chinese TV news programs are reporting that a man in Changchun owns a turtle that smokes ten cigs a day. The turtle even makes chirping noises when it wants smokes or walks over to its owner when he's puffing away. Make that, walks slowly. Animals picking up nicotine habits isn't unheard of, but they are often monkeys (here or here, for example). But a turtle that smokes? More amazing (or depressing) is that apparently there already was another turtle in China a few years back that also smoked. This isn't a first! The reptile picked up the habit this June when its owner flipped the animal to remove a thorn from the animal's underbelly. According to the owner, the turtle tried to bite him, so to pacify the critter, he put a cigarette in its mouth. The turtle was hooked. In the past few years, China has been rolling out strict anti-smoking laws. Yet, many people ignore them as smoking is generally socially acceptable, and the country is still the largest consumer (and producer) of tobacco in the world with over 350 million smokers—at least one of which is a turtle.